Designer Cologne and Perfume 4 oz. CK-9 Uni-Pet Boy and girl dogs agree, they both love splashing on CK - 9. A very relaxed fragrance filled with papaya, pineapple and jasmine, with undertones of green tea and amber. 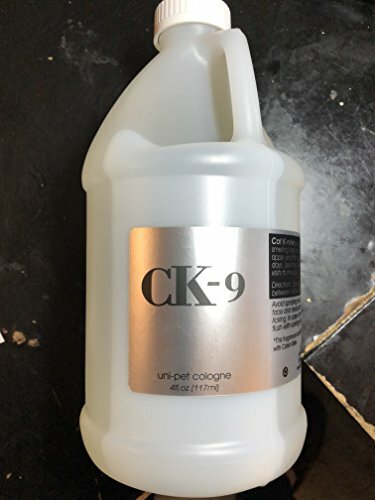 CK - 9 is naturally clean, pure, and contemporary. Keep your dog in the running with CK - 9. A very relaxed fragrance filled with papaya, pineapple and jasmine, with undertones of green tea and amber. 64 oz refill CK - 9 is naturally clean, pure, and contemporary. Keep your dog in the running with CK - 9. If you have any questions about this product by Refill, contact us by completing and submitting the form below. If you are looking for a specif part number, please include it with your message.